Although the beans are spread throughout America, without a doubt it is the Mexican gastronomy the one that has adopted them as one of their 3 main foods: maize , chili and bean. The beans form part of the daily and basic diet of the Mexicans . They are consumed a lot at all times and in all the places. There are infinite ways of preparing the beans but almost all start from a same base known as the pot beans. 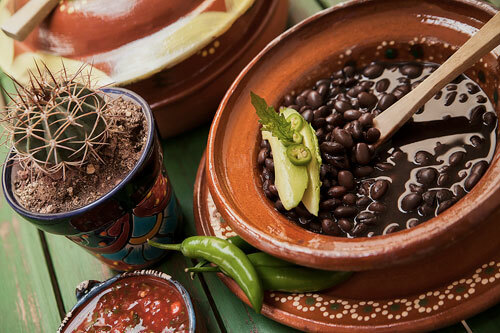 The pot beans recipe is very famous as it is eaten in all Mexico. This dish consists of a kind of thick soup that has whole beans immersed in a type of broth. It really is a simple recipe but its flavor is extraordinary. This recipe has infinite applications within the Mexican cuisine as it can be served as breakfast accompanying some scrambled eggs with chorizo , as appetizer , as soup , as garnish of a lot of main courses or as base of many typical Mexican food like sopes, gorditas, enfrijoladas, tlacoyos, etc. This recipe is not complicated to make, you will like it a lot. If you have a clay pot use it to prepare these beans. The flavor that the beans acquire while they are cooked in clay is the traditional. Normally these beans are prepared with bayo, black or pinto beans. The total preparation time is long because the beans are left to soak overnight, then the beans cooking takes about 3 hours or 45 minutes in the pressure cooker. Spread over your work table 1.1 lbs of beans and discard the pebbles and gravels that you find. Transfer from the work table to a colander the beans that were cleaned and rinse them. Transfer from the colander to a bowl the beans that were rinsed, cover them with water and leave them soaking for about 10 hours, until they soften. The beans are left soaking so they cook faster. Verify that the beans that were left soaking are soft, if not leave them soaking for a longer time. Transfer from the bowl to the colander the beans that were soaked and remove the water excess. Transfer from the colander to a saucepan the beans that were soaked and cover them with water. The water must exceed 3 times the beans portion. When the water boils reduce to the lowest heat that allows the boiling to continue, cover the saucepan and cook the beans for about 3 hours, until they have completely softened and they have the consistency of a watery soup; stir occasionally. While the beans cook check that the water doesn’t go below the beans’ height because they can burn. If you have to add more water put them water that is almost boiling. Approximately 10 minutes before the cooking is done, incorporate in the saucepan 1 epazote sprig and mix the ingredients. The epazote gives very good flavor and aroma but it doesn’t resist a long time on the fire – its flavor is lost. When the cooking is done add in the saucepan 2 tablespoons of salt and mix the ingredients. Tip: If you eat these beans plain, they have to accompanied with bread or tortilla and some Mexican cream and fresh cheese. Variation: Now taste the beans, a little more elaborated, in their charro version. Did you like the Pot Beans? This is the Clay Pot that you have to use to cook your beans. Get ready to taste the beans with a flavor that you had never tried before. This “OXO Colander" is a good addition to your kitchen because it is stable, it has a good grip, a 5 quart capacity and it is made of stainless steel. If you need epazote this bag of natural epazote will fix your problem. This epazote comes dry and crushed; but the flavor and the aroma that gives to your food will be authentic Mexican.